PRESIDENT XI JINPING’S CONFUSION AND DILEMMA - Integration Through Media ....! 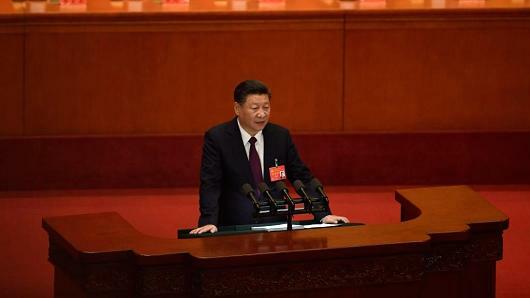 In his marathon opening address during the conference of the Communist Party of China (CPC), Chinese President Xi Jinping has spoken about “principal contradiction” facing China. Even while political observers are having hair- splitting scrutiny on what President Xi Jinping has meant by “ principal contradiction” supposed to be now facing China ,it appears that Xi Jinping may not be very clear himself as to what he means by this term. Obviously, he is not too sure as to whether the present Chinese government is anymore a communist type of government at all. The last several years of governance by President Xi has taken China far away from the communist philosophy of piloting the proletariat movement and waging a class war between the working class and the capitalists. Today, under the leadership of President Xi, the domestic private sector in China is forging ahead with great thrust and multinational companies, which were crticised by communists as self centred capitalists and exploiters , are playing a leading role as investors in China and are contributing enormously to the industrial and economic growth of China. Whether President Xi would publicly admit or not , the fact is that without the industries and research bodies set up by domestic private enterprises and foreign companies ,the growth of China would not be as spectacular as it is seen today. For example, in the past several years, in the chemical and petrochemical sector which are very important thrust area for growth in China , domestic private companies have expanded at a faster pace than state owned enterprises and challenged their dominance. With regard to profit growth in the chemical and petrochemical industry sector, between 2005 to 2015, it was 33.5% for domestic private companies and 13.2% for foreign companies ,whereas it has become negative of 11.9% for state owned enterprises. The market share of private domestic companies which was 28.5% in 2005 went up to 49% in 2015, whereas the market share of state owned enterprises which was 41.1% in 2005 slided down to as low as 21% in 2015. The market share of foreign companies in 2015 was 30%. In 2016, the private investment in fixed assets in chemical and petrochemical industry reached 36,521.9 billion Yuan, a year-on-year increase of 3.2 percent in nominal terms . The domestic private companies and foreign companies in China are expanding, changing the structure of the industry sector considerably. In communist philosophy, the state owned enterprises should hold full or dominant role in the industrial and economic growth of the country. But, this communist philosophy has been given a go by in President Xi’s governance. By using the term “ principal contradiction”, President Xi is obviously admitting the fact and ground reality that his policy measures and approach and his encouraging domestic private sector and foreign companies to play a principal role in China’s growth has been the contradiction to the communist philosophy, in which name the government of China is supposed to be functioning today. All said and done, China is no more having a communist government in the real sense of the term. Name communism exists in China only for the sake of it’s name and it helps the leaders like President Xi in having dictatorial form of governance and ruthlessly putting down the dissenting voice. This also helps in preventing the demand for personal freedom and democratic form of governance. President Xi is now talking about pride of China and lifting China to be a moderately prosperous country by 2021, relying on his private sector and foreign companies investment model. President Xi has recognized that in China today, there is stress between unbalanced and inadequate development and people’s ever growing needs for better life. The essential communist philosophy is equality of income and opportunities for all and avoidance of disparity in income between people. By adopting policy of encouraging privatization and massive investment by foreign companies in China , President Xi has established the fact that overall prosperity is possible only by recognizing private initiatives and state owned enterprises need to have only a limited and restricted role. He has silently recognized the fact that the government is to govern and not to manage business. What President Xi meant by “principal contradiction” appears to be the contradiction between the communist philosophy and the need of the society and his present style of governance. To this extent, President Xi has opened his heart and has given vent to his frustration that basic tenets of communist philosophy is weak and unrealistic. Unfortunately, today, there are few ardent communists in the world, who are left in the scene to defend the communist philosophy, particularly after seeing the recent changes in China and which was earlier preceded by similar changes in Russia and East European countries.